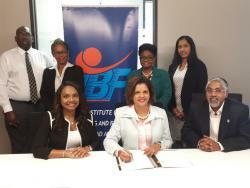 Bangor University Business School is pleased to announce a new global partnership with the Institute of Banking & Finance of Trinidad and Tobago. 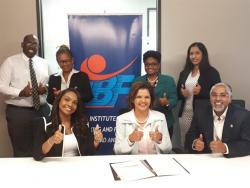 Institute of Banking & Finance of Trinidad and Tobago Signing Ceremony Through our Partnership we are collaborating to offer the Chartered Banker MBA – a global MBA programme in Banking and Finance to provide cutting edge and innovative learning for the Caribbean Financial Services Sector. Here’s a photo from the signing ceremony. Back row: (Left to Right) IBF Directors: Mr. Dexter John, Ms. Tsahai de Silva, Ms. Karen Bazil and Ms. Arianna Ali. Front row (seated): (Left to Right) IBF CEO, Ms. Marsha John, IBF President, Mrs. Misty Dorman-Hosein and IBF Vice-President, Mr. Darren Ali.